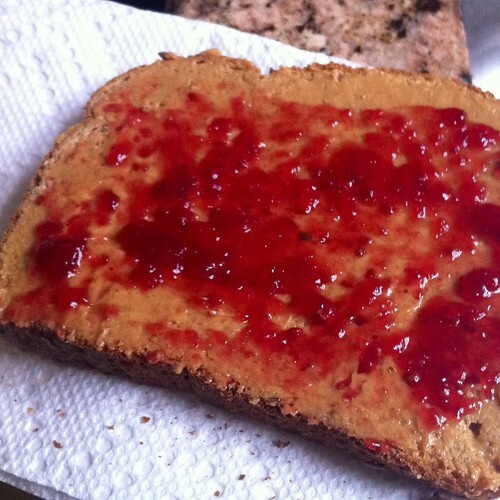 The day started out with a slice of whole wheat toast (100 cal), a tablespoon of peanut butter (80 cal), and a smear of sugar-free raspberry preserves (5 cal). 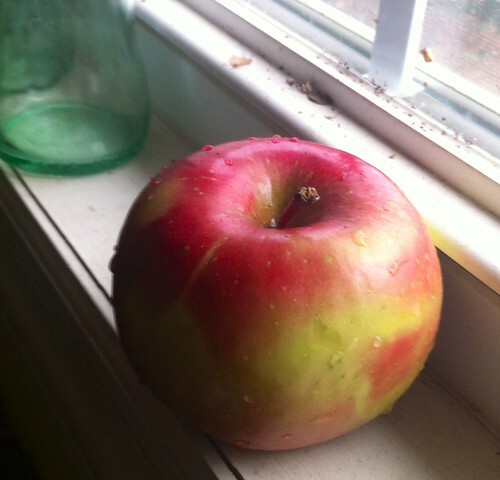 Then an apple as a morning snack (80 cal). 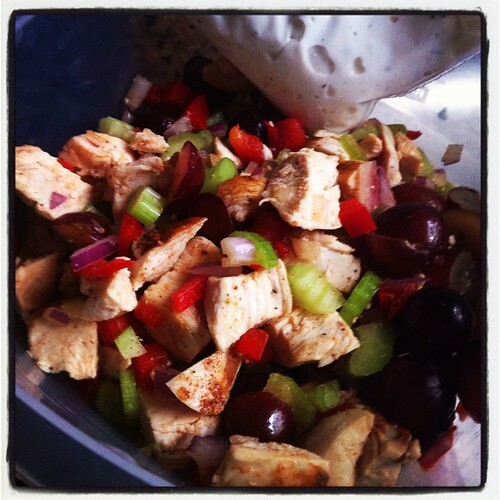 The first part of lunch was a serving-and-a-half of my healthy chicken salad (200 cal). 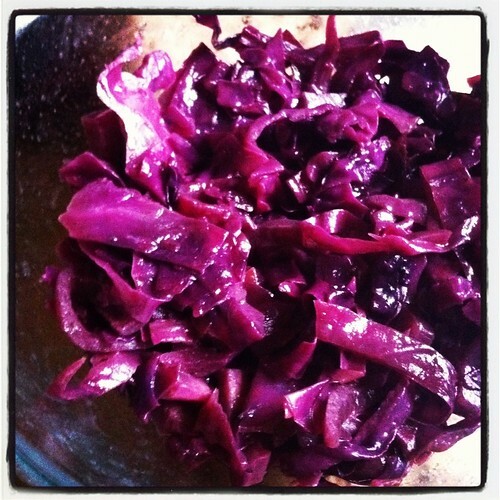 Followed by the rest of my balsamic braised red cabbage (~200 cal). Just as delicious cold as it is hot! Unfortunately, my stomach started to feel kinda weird before dinner, so I wasn’t feeling up to much. 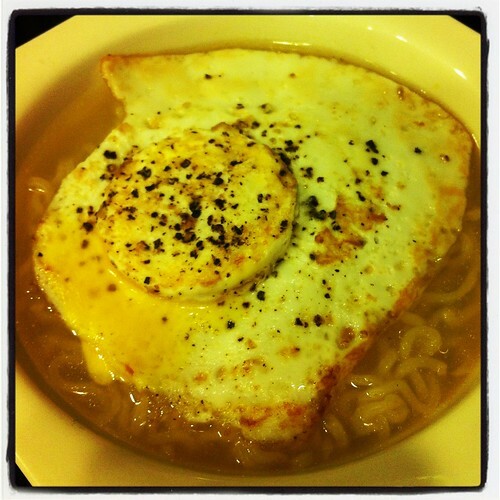 I ended up copping out and making a bowl of ramen (380 cal) and an egg (90 cal). Total for the day: 1,135 calories. Kind of low! Guess that means there’s time for me to nom on a couple Hershey’s miniatures to balance me out, haha. Win! Catching up? Check out my previous Weight Loss 101 posts! Water. We need it to, you know, live. 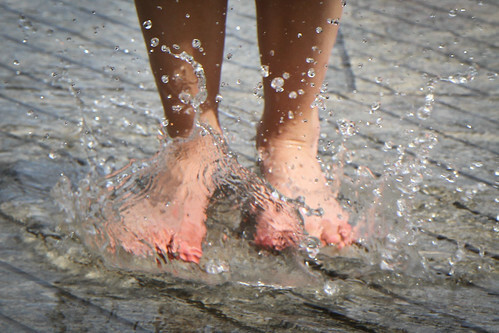 It lubricates our joints, regulates our system, gives life to our cells, and heck, we ARE it — you know, what with that whole thing about the human body being two-thirds water (source). There’s no doubt that staying well-hydrated is an important part of weight loss, too. Thirst can masquerade as hunger, causing us to eat more and, though it seems a bit counter-intuitive, being dehydrated actually makes you retain water. This causes bloating and (water) weight gain, which we all know can have a dramatic impact on our motivation and self-esteem. I don’t know about you, but I am TERRIBLE about drinking enough of it. Depending on where you live, your weight, how much you exercise and sweat, etc, the specific volume of water you should be consuming may differ. Even just going by the old standard “8 x 8” rule (64 oz, or eight glasses full of eight ounces of water daily), I find myself constantly falling short. I don’t know if it’s just because I’m too lazy to refill my water bottle, or if it’s ’cause I really just don’t think about it, but I would say I am under-hydrated on more days than not. To that end, I’ve compiled a few of my tips for staying hydrated that I’m sure will make you say “well, duh.” Also, you’ve probably already heard/read them 1,000 times before. But now you get to read them again! Huzzah! At my last job, there was one of those little water coolers (you know, the kind with the big plastic jug that makes the “bloop bloop” noise when it bubbles?) about 4 feet from my desk. I could essentially swivel my chair and have water at my fingertips. I drank so much more water at that job than I do now, where I have to walk the length of the office (the horror!) to get to a water fountain! Why? Convenience. I’ve admitted to my laziness time and time again (at this point, it’s practically boasting! ), so making something easy to access is a number one priority for me. If you find yourself without a similar convenience, try asking your office manager if you can get a similar water cooler installed in a central place, or get a mini-fridge to keep at your desk to store pre-filled bottles in. 2. Carry it with you. Okay, so maybe your boss says you don’t have the budget for a more hydration-friendly office, or you’re thinking about those non-office moments (rare though they are). Well, no fear, there’s an even simpler way to ensure you have water available at all times. 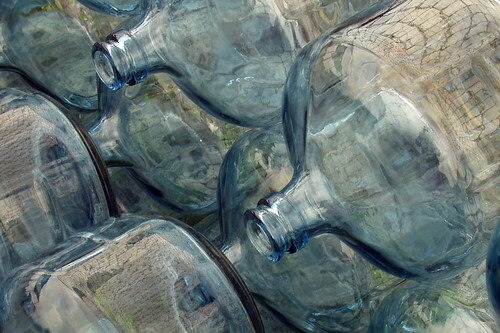 Just make sure you always carry a bottle with you. (See? Cue the “… duh”s.) Now, for bag ladies like me, it’s easy to toss a Klean Kanteen or other reusable water bottle into your giant purse. If, however, you find you’re needing another way to hang onto your hat bottle, might I suggest a bottle holder? And if you hang around until the end of the post, you’ll even have an opportunity to win one! – Add a squeeze of lemon or lime to ice water when at a restaurant. – Enjoy a drizzle a touch of honey in a steamy mug of hot water on cold days. 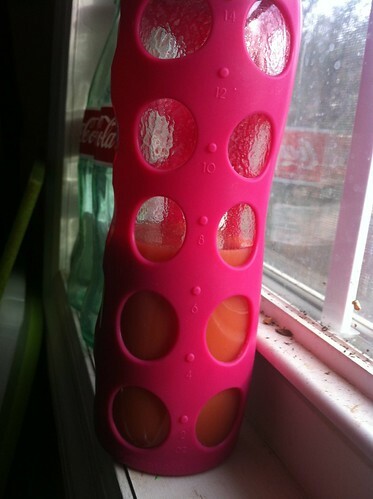 – Use frozen fruit instead of ice cubes to give your glass some color and zing. – Homemade cucumber water is very refreshing (it makes me feel like I’m at the spa, haha) and just about the easier thing ever: slice cucumbers, add to water. Ta-da! 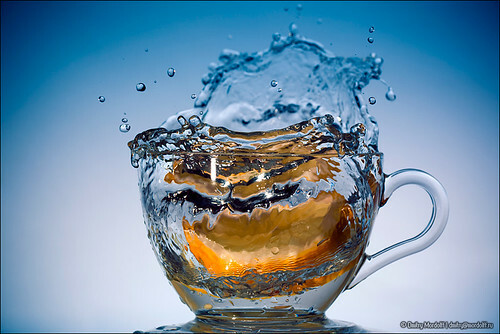 There are tons of combinations and experiments you can do make water more appealing to you. Try a few of them out! So there you have it. Whether you like your water fizzy, flavored, or flat, there’s no excuse not to try to get your 64 oz. in each day. And for one of you, it’s about to get even easier. Giveaway time!! 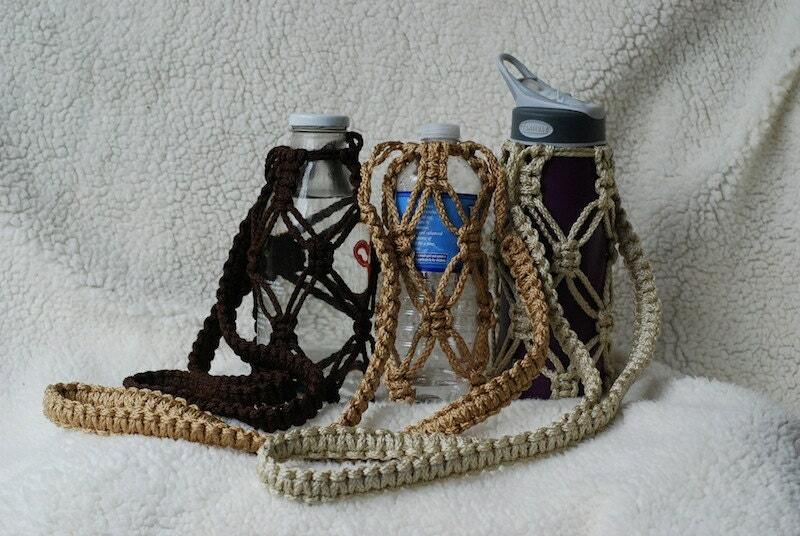 My good friend Sarah‘s mom handcrafts the very macrame water bottle holders you see in the photos above. They come in three colors (pearl, tan, or brown) and one of you will win one in the color of your choice! I have one, and I love that due to its drawstring top, it’s flexible enough to fit a variety of bottle sizes (from the standard plastic water bottle to my giant reusable ones!) It’s soft, lightweight, and would be great to sling over your shoulder on a hiking trip or photography tour. 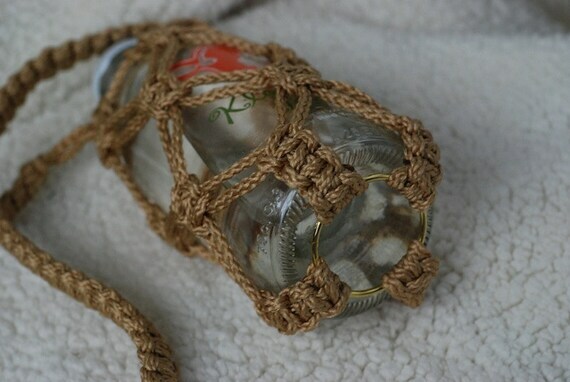 They are also available from her Etsy shop, and she’s also working on designs for a farmer’s market bag, as well as a wallet that will clip onto the bottle holder. Neat, huh? To enter, simply leave a comment offering your favorite tip for staying hydrated. Be sure to indicate which color you would want, too! 3. Blogging/posting/tweeting about this giveaway! Just make sure to leave a separate comment here for each thing you do to ensure you have multiple entries! I’ll be drawing a random winner on Wednesday, January 11th. Yesterday’s eats! Forgive the iPhone photos. Laziness strikes as always again! I started with ~6 oz. of V8 Smoothie (Strawberry Nanner) watered down with some tap water to create an equal 8 (90 cal). 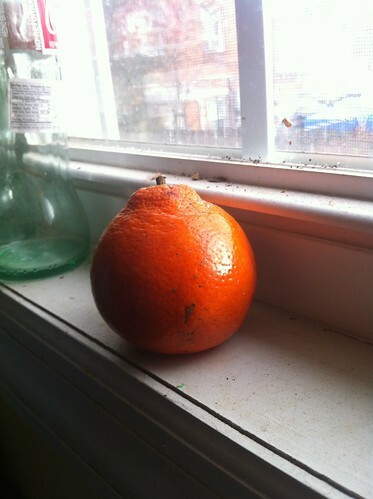 And a clementine (35 cal). 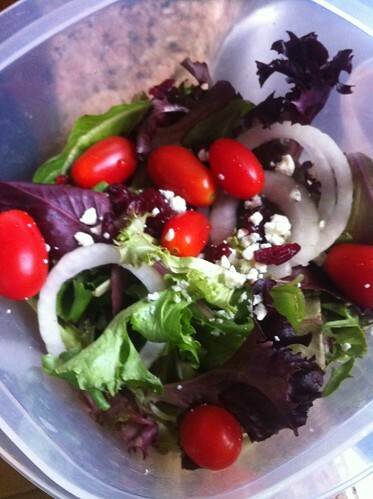 Lunch was a multi-parter, starting with the good ol’ salad I’ve been enjoying for the past few days — greens, onion, grape tomatoes, craisins, blue cheese, and balsamic dressing (~200 cal). 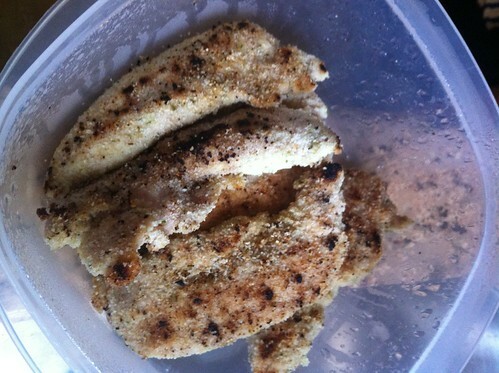 Followed with a crapton of cornmeal encrusted chicken tenders. I didn’t intend to eat all of them but… you can probably guess what happened, hehe (~300 cal). 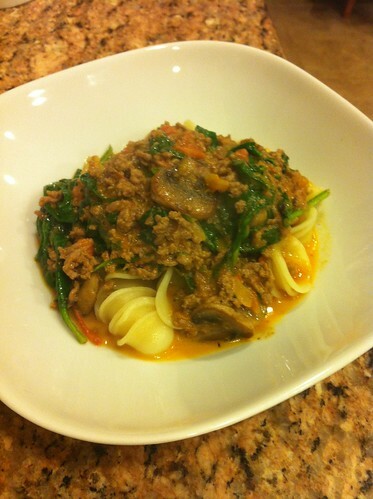 1 cup of orrecchiette pasta topped with a homemade sauce which included ground beef, Trader Joe’s Vodka Sauce (SO good), mushrooms, and a crapton of spinach. Delicious. I went back for just a smidgen more afterward, hehe. (~700 cal). Unpictured: Activia Nonfat Blueberry Greek yogurt (190 cal). Total: ~1,515 calories. Winning! Still got to work on that inverted pyramid though… whoops.